VueMinder Calendar Pro: Hot Brownload Award! 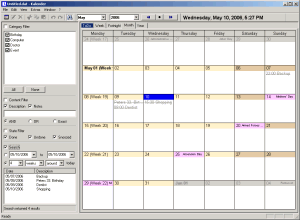 Spent a bit of time checking out what was supposed to be one of the better calendar programs out there – VueMinder Calendar Pro. At first glance, it looks really nice, but that’s where the delight ended. It’s sluggish, so colourful that I almost blipped out in an epileptic paroxysm, kept throwing a reminder window into my face despite me cancelling it, snoozing it, you name it.. and worst of all, it failed at the primary reason I was testing it out – I wanted to be able to subscribe to my Google Calendar and then edit events from the VueMinder interface, like I currently do with Sunbird. Subscribe, yep. Edit? Warns you that any edits made to existing events in a subscribed calendar will be lost at the next sync.. BUT you can add a reminder to them if you like! FAIL. Want a good, free calendar that enables Google Cal syncing? Get Sunbird. Want everything else? Buy Outlook 2007. Seacrest out.